Reading is one of my favorite activities with my 2 year old. Story time is always fun with Rolfie. We are especially fond of personalized books. When we received a copy of My Very Own Pirate Tale from I See Me, we couldn't wait to read it. As you can see my son really liked this book! Rolf really liked hearing his name in this book, and he loved the colorful illustrations. It was a really fun book to read to my son. The story is cute and sure to please any toddler. I liked the durability of the book. My son can be rough with non board books. I See Me offers a variety of personalized books. These books make a great gift that will be treasured for years to come. Not only is the story special for kids, but the book is a gift that keeps on giving. I am considering a few other titles that I think my son would like. I love the idea of creating a special gift for him, complete with details of his life and a dedication. 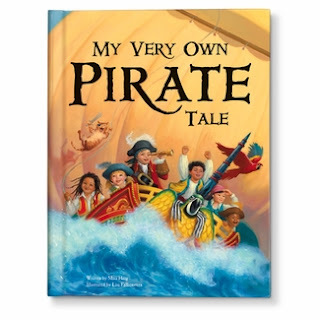 One lucky Sweet Silly Sara reader will win a copy of My Very Own Pirate Tale from I See Me. Come back from August 9-22 for your chance to win. Use the code MATEY to get an awesome 15%discount on pirate products from I See Me. This coupon is good throughout August 2012.